Fiona McCallum has got another amazing story to share. Her love of writing and storytelling is apparent in this beautiful book. 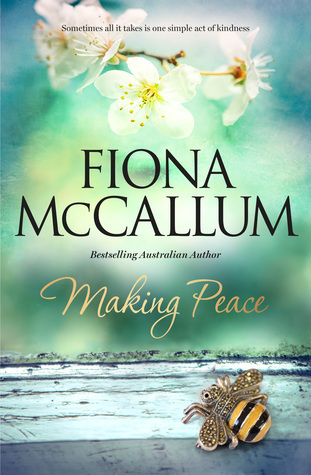 Making Peace is the sequel to McCallum’s Finding Hannah, but may be read as a standalone novel. It’s been a year since Hannah Ainsley lost her husband and parents in a tragic Christmas Day car accident. She has spent the last year still reeling from that loss, yet supported by an amazing group of friends, and her new pets Holly and her kittens Lucky and Squeak. She has started back to work at a job she loves, and the adoration for her boss is unwavering. However, it seems the job has lost some of the appeal and she doesn’t feel the same connection to it. Meanwhile, Hannah’s best friend and most staunch supporter Sam, is struggling with issues of her own and is desperate need of help. Hannah is determined to return the compassion she received from Sam and so badly wants to help her friend, but isn’t quite sure how. Then she meets someone who will help her understand that kindness is worth its weight in gold. Keeping busy and focusing on new issues seems to be just what Hannah needs to feel her own worth. Is there really a light at the end of the tunnel of grief? With all the change in her life, there is one thing that remains constant – a supportive group of friends. I absolutely loved how this book read, and I’m ready to move to Melbourne to insert myself in this group of friends. The message of kindness is so sweet and simple, yet so vital to all of us. Thank you to Net Galley and Harlequin AU for the ARC of this lovely book. Sign into Goodreads to see if any of your friends have read Making Peace.